In my previous article, I dispelled some of the myths surrounding the toxic notion of dirty bulking and how to bulk the right way. Not only is it a downright ignorant way of approaching nutrition, it’s also devastatingly unhealthy. Instead, we concluded that clean bulking with a gradual calorie surplus and higher protein intake was the right way to approach long-term dietary success in adding on lean muscle mass. Today, I want to discuss a consequence of the impulsive desire of lifters across the globe to add muscle mass via dirty bulking in regards to the sports supplements industry. In the last two decades, dietary supplements have became an astronomically big business. So big, in fact, that recent projections suggest it will grow to a staggering USD 278 billion industry by 2024. With eye-watering figures like this, it is no surprise to see hundreds of companies with new products exploiting the opportunity to deceive muscle-hungry lifters. The “mass gainer” category of supplement best epitomizes this. Mass Gainers have been marketed cleverly. They’re hyped up as the ultimate all-in-one solution for adding quality calories to your diet in a convenient, single formula that takes the guesswork out of nutrition. They’re “loaded” with “high-quality proteins, carbohydrates, and fats”, making it “easier than ever to build muscle”. And invariably, it’s often suggested to consume the product at least twice daily to ensure you meet your daily calorie requirements, which inevitably go up when you’re trying to build new muscle tissue. It’s a Lie. It’s a Sham. Mass gainers are low in protein and notably high in sugar. Sugar only makes you fat. This is the part I simply don’t get. Since when did ingesting carbohydrates became a problem when obesity is a worldwide epidemic, they even have a word for it – Globesity. If only it was that simple. Mass gainers are loaded with crap, empty calories, and jam-packed with sugars, trans fats, and other processed garbage. Honestly, I feel mass gainers are nothing but crap. If all you care about is increasing your sugar intake, you’d find plenty of sugar in your kitchen cabinet. Why pay 10 times more money to a supplement company? And if you thought the redeeming factor would at least be a quality protein source, think again: mass gainers are often comprised of skimmed milk powder or other forms of milk concentrate to cut costs at every possible corner of the formula. So while they’re definitely high in calories and highly marketable, they’re anything but desirable for somebody to add lean muscle tissue who simultaneously wants to suppress unnecessary fat gain. Below are a few of the most rehashed ingredients you’re likely to find in mass gainers that you should be aware of, as well as the marketing gimmicks used to flog them to the masses. Maltodextrin: Companies adore maltodextrin, because it’s cheap, tasteless, and isn’t listed as sugar content on the label. It makes it a highly marketable ingredient and is constantly spun as a “complex carb” that doesn’t add fat. The truth is very different. Maltodextrin is a cheap filler ingredient that spikes blood glucose (high GI) almost identically to pure sugar itself, and can essentially be considered as bad given its effects on the body. If maltodextrin is the first carbohydrate source you see listed on the label, you know you need to avoid the product at all costs. Fructose: Although it’s a simple sugar, fructose isn’t inherently bad when found in whole foods such as fruit. When it’s on a mass gainer or a weight gainer, however, you can be damn sure it’s used as another sweet filler due to its taste. Dextrose: Known for its ability to rapidly spike insulin levels, dextrose is another simple carbohydrate that big businesses love to bloat the products further with. If it’s high up on the label, rest assured you’re being duped. Skimmed Milk Powder: A cheap and inferior source of protein used to bulk out the protein content of the product and also due to its mixability. Don’t be fooled, again. Adding lean muscle mass takes time – there’s no other way around this fact. Being meticulous with high-quality calories from whole foods is the best approach, irrespective of whether you’re a hard-gainer or more of an endomorphic body type. 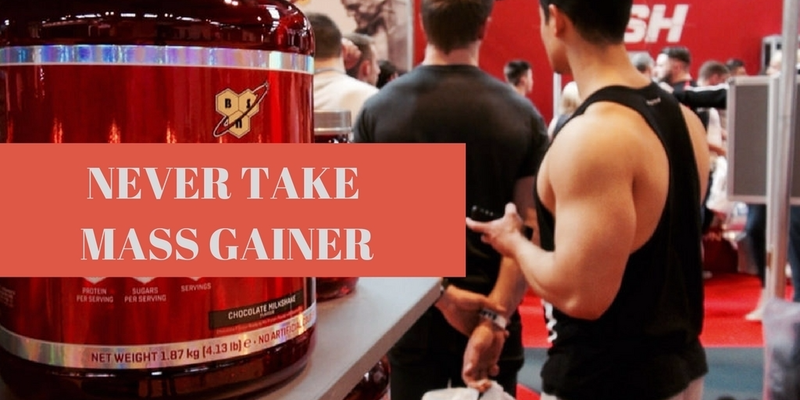 Whilst the concept of a mass gainer or a weight gainer might sound alluring at first, a quick glance into the ingredients profile on most products quickly reveals all you need to know about the company’s true intentions: to rip you off, not build your muscles. If you really want to add quality calories to your diet in the form of a protein shake that’s convenient, consider adding whole foods such as bananas, oats, nuts, peanut butter, milk to a regular, high-quality whey protein powder.